The 2005 World Series of Poker continued to see unprecedented growth fueled by online amateurs that had been inspired by the win of Chris Moneymaker in 2003. Forty-four preliminary events were on the schedule, and, despite the major presence of amateurs, many of those events were won by professional players. T.J. Cloutier added a sixth bracelet to his collection when he won the $5,000 no-limit hold’em event. Phil Ivey added his fifth when he won the $5,000 pot-limit Omaha event with rebuys. Erik Seidel claimed a seventh bracelet when he won the $2,000 no-limit hold’em event. Eric Froehlich became the youngest player to ever win a bracelet at the time, at just four months over 21, when he won the $1,500 limit hold’em event. Mark Seif won two bracelets in 2005, walking away with titles in the $1,500 limit hold’em shootout and a $1,500 no-limit hold’em event. Doyle Brunson and Johnny Chan made history that year when they both won their record 10th gold bracelets, giving them the shared title for the most of all time. Allen Cunningham captured Player of the Year honors after making four final tables and winning the first open event, a $1,500 no-limit hold’em tournament. He also became the first player in the history of the WSOP to win $1 million dollars before the start of the $10,000 no-limit hold’em world championship. The main event attracted a field of 5,619 entrants in 2005, but only nine of them could make the final table, a final table that was the longest in the history of the WSOP. Defending champion Greg Raymer did not make the final table, but he did a solid job defending his title before falling in 25th place. The final nine that year included Mike “The Mouth” Matusow, Brad Kondracki, Daniel Bergsdorf, Scott Lazar, Andrew Black, Aaron Kanter, John “Tex” Barch, Steve Dannenmann, and Joe Hachem. The first elimination that year took almost two hours to happen. Matusow was all in with pocket tens against Dannenmann, who held A-J, but he made a wheel on the turn when a 4 joined the 5-3-2 board. Matusow was out of the tournament in ninth place, and he kept his composure well after the bad beat. Kondracki fell an hour later when he failed to crack the pocket eights of Black, neither an ace nor a queen came to the aid of Kondracki, and he was knocked out of the tournament in eighth place. Shortly after dinner, another battle involving a pocket pair was fought, and another player was eliminated. Bergsdorf held pocket jacks against Barch and his pocket tens. Barch hit a 10 on the flop, and Bergsdorf was eliminated in seventh place. A pocket pair had a hand in the next elimination, as well, as Black used pocket jacks to send Lazar to the rail in sixth place. The next stretch of play featured a stubborn final five that did not produce one elimination for the next 3.5 hours. Multiple players doubled up, and Kanter won a 15 million pot before the fifth-place finisher hit the rail. That distinction belonged to Black, and he held pocket tens in the hole when it happened. Dannenmann won the classic poker race when his A-K in the hole found another king on the turn. Black was out in fifth place. It took another three hours for Kanter to be eliminated in fourth place. He faced Dannenmann, who held pocket jacks, with A-9 in the hole. Kanter received some help when a 9 fell on the river, but it was not enough to prevent his ultimate demise. An hour and 20 minutes after that, it was Barch who decided to make his last stand by raising all in for 5.65 million after Dannenmann raised to 750,000 and Hachem had made the call. Dannenman and Hachem then both decided to call the all-in bet of Barch, and they checked down the side pot on a board of 10 3 2 Q 9 . Hachem turned up pocket jacks, Danneman showed pocket sevens, and Barch mucked A-6. He was eliminated in third place. The 16 million that Hachem had won on the elimination hand of Barch grew his stack to almost 40 million, which gave him a solid lead over the amateur Dannenmann, who held just over 16 million and was loving every minute of the exciting final table. The heads-up match proved to be the shortest stretch that took place before an elimination occurred, when just 15 minutes after things started heads-up, a world champion was crowned. Dannenmann raised to 700,000, and Hachem made the call. 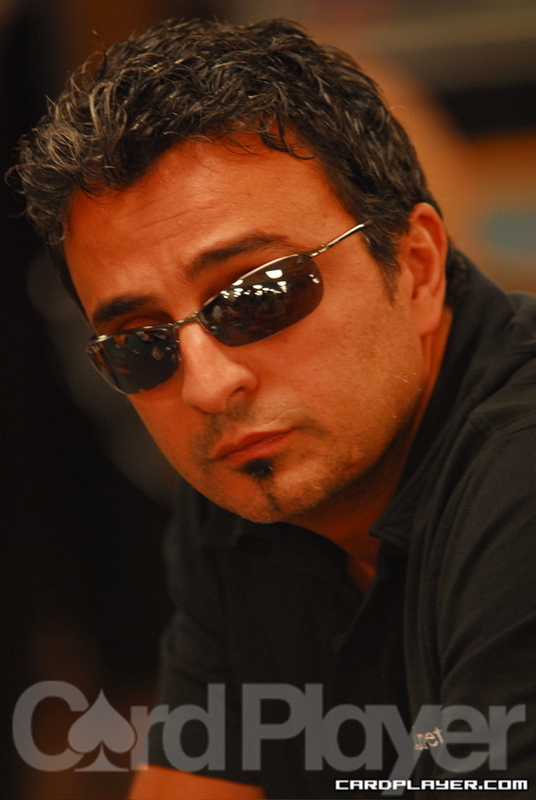 The flop was dealt 6 5 4 , and Hachem checked. Dannenman bet 700,000, and Hachem raised an additional million. Dannenmann made the call, and the turn fell A . Hachem bet 2 million, and Dannenmann raised to 5 million. Hachem reraised all in, and Dannenmann made the all-in call. Hachem turned over 7 3 for a flopped straight, while Dannenman held little hope with A 3 in the hole. The river brought the 4 , and Hachem was crowned the world champion. The jovial Dannenman was eliminated in second place, and he won $4.5 million. Hachem hails from Australia, and his victory was celebrated by cheers from his Australian supporters. Shouts of, “Aussie! Auissie! Auissie! Oy! Oy! Oy!” spread throughout the Horseshoe as the sun rose outside over Las Vegas. The final table, which started just before 5 p.m., had ended just before 7 a.m. the next morning. Sadly, this was the last year that the final table of the WSOP main event was held at the Horseshoe; it was moved to the Rio All-Suite Hotel and Casino the very next year.